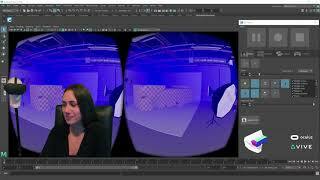 Make Virtual Reality with VR-Plugin Viewer. Explore your work in Virtual Reality within seconds. VR-Plugin brings Autodesk Maya Viewport 2.0 content to your Virtual Reality device and runs on your Oculus Rift and HTC Vive with native 90 FPS Stereo. Leave your 2D screen and immerge into a 3D Virtual Reality environment. The Virtual Reality extension for Autodesk Maya will give you a unique feeling for scale and scene proportion. VR turns out to be just perfect for Previz and Layout tasks. Benefit from 1:1 conversion to your final product. The Viewer license will give you a good overview of the display and tracking performance inside Maya. Visit our website VR-Plugin.com, sign into the forum and download VR-Plugin 6.0 Beta 3. The Beta comes with hand controller implementation to edit Maya scenes in Virtual Reality. This version of the plugin is compiled for Autodesk Maya 2014/2015/2016/2016.5/2017/2018 Windows 7-10 x64 and is compatible with the Oculus Rift and HTC Vive. I just tested the trial version and loved the fact that I was inside the environment that I created. This plugin is very promising and the potential of future 3d designing in VR. I loved the initial test and experience. A really awesome Plugin for VR Artists! Great tool to check proportions and animaions of your creations for VR! No problems with installing, really easy to use (You basically have to do one Click and can check out your model in VR). Locomotion with Gamepad also works great. Have been using and tracking this product through several releases and this one hits the mark. Easy to install, works with 2018 and with my 1080ti is lag free. Highly recommended if you are building for VR.